Double Digit by Annabel Monaghan. The Sequel to A Girl Named Digit. 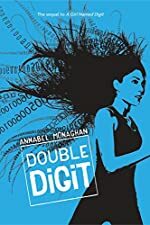 Review: If you're looking for a book that a young teen would enjoy, then the book Double Digit by Annabel Monaghan is the perfect choice. This book has mystery, action and suspense. It is a sequel to A Girl Named Digit. In Double Digit there is a girl named Digit. Digit is called that because of her love of math. Digit tries to be a normal college girl. She goes to a lot of parties. Then her boyfriend came to visit her in college. He works for the FBI. Then one night Digit and her friend Tiki were walking home and to get to her dorm she has to go down a dark hallway. Then she feels an arm around her neck and the end of a blade touching her skin. She bites his arm and calls for help. The security comes and the criminal jumps out a window. Digit gets taken to the hospital cause he slit her throat. She calls her ex boyfriend. When her ex boyfriend arrives they get a call. When they answer the call they say that Digit is going to jail because of her hacking into the district of defense (DOD). Then they drive to a cabin and figure out that Digits ex-boyfriend's friend Spencer who was a girl was evil and working for the criminal. Suddenly, they got taken to the bad guys lair the lair was all solar powered and all natural. The bad guy was apparently looking through her laptop and seeing everything she has been doing and found out what she had been hacking. They told her to hack into the DOD program again and if she doesn't they will kill her. They already took her ex and said they were going to kill him. She stated hacking and kept taking breaks she would go down to the sleeping area to see that Danny and her ex's dad is there. They called her back up to work. Double Digit is intended for ages 12 and up due to language. I like that in this book the main character is a girl. I like the suspense, also that its about how a girl does everything on her own and figures them out by herself. Young teens would like this because of the suspense and all of the mystery. A girl would more be likely to read this book cause it is based off of a young love story gone wrong. So if you like mystery, suspense, and a bunch of actions then Double Digit is the perfect book for you. Review written by Kirsten (6th grade student). We would like to thank Houghton Mifflin Harcourt for providing a copy of Double Digit for this review. Have you read Double Digit? How would you rate it?